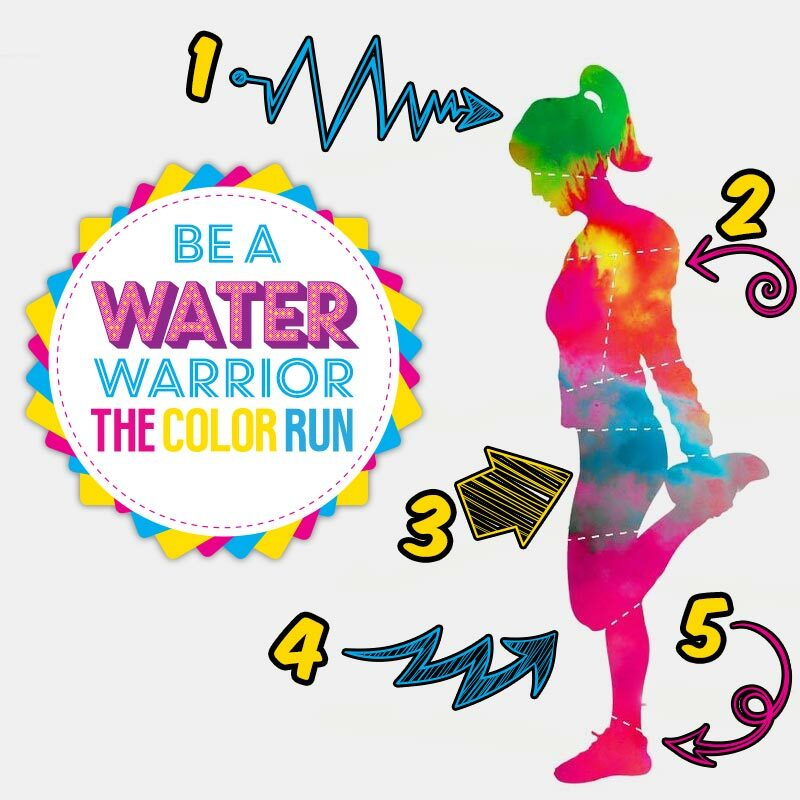 Be a Water Warrior at The Color Run! The Color Run is coming and we’re pumped up for the Happiest 5k! As we all know the WC (and other large parts of the country) are still struggling with the massive drought and water restrictions that are in place. As always, The Color Run is focused on community and this includes a conscious effort to ensure that the region only benefits from an influx of heroes. We’re looking to leave every event cleaner than it found it – and it will be using ONLY non-potable water for cleaning, and only where absolutely necessary. Additionally, we have sourced and purchased non-potable water from accredited suppliers, who will be bringing water to the event from outside the effected areas. The event will also be minimising mess, and minimising the need for water-based cleaning, through massive PVC sheeting, great-big vacuum cleaners, and muscles – meaning more jobs on the day for the region. We’re also looking to make lemonade out of lemons and will be collecting all the very colourful race tees after the event. If you want to donate your tee then we will ensure they are cleaned in an area where there’s more water to spare, and distributed to the a great cause / NGO. • There will be a clean-up area at the Festival Zone where participants can get the powder blown off before leaving. We are using high-powered leaf blowers, which are hugely effective. • We have done away with water and are only providing Koee fruit juice at the water point and end point. So that’s us… now what about you? We’re in it together and our CT team wanted to give you some simple heads up on what we can do ensure that we’re all water warriors at this years Superhero tour! It’s simple, you know you’re coming to the run and you know you’ll be cleaning up so stockpile a shower if you need a little extra by skipping a shower the day before and deffo don’t clean up the night before or on the morning before you come and see us! You’re going to get messy, it’s no biggie! Let’s start at the top and make sure we’re using our pip! – Donate your t shirt in the bins provided. We will wash in a non-water scarce area and donate to a needy institution. If you want to keep your Tee, no problem – just pop in the regular cold wash with dark colours. ONE wash is enough. Heck, we’re at this 13 events a year and we never need to double dip our rainbow encrusted gear!! – DON’T wear your favourite G-Star/Diesel/Nike togs it’s not going to end well. To wash – ONE wash in cold water with dark colours is enough. We even run our machines on the quckie 19 min cycle and we look spick and span at all times. Our moms would be proud! – wear long socks to minimize the powder on your body. Not only is this sensible but it looks pretty great as well. – Don’t wear your brand new Nike Airs – wear comfortable shoes that you don’t mind getting a bit of character. Plus is that after the run you have a unique piece of art to remind you of the day. Don’t blame us for your previously dirty skanky shoes. Finish your run with a visit to the Clean-Up Zone where we’ll help you get rid of a lot of the rainbows you’re collected along the route. Key thing is that our powder actually doesn’t like water too much so dry brush, blow and then what little colour that is left will need less water… Nice. The powder comes off very easily. A regular 90 sec shower should do the trick if you follow the water warrior pointers above.Get soaped up and shampoo in before you even turn that tap. Remember – nobody in the history of The Color Run has been permanently stained pink or blue – you may have a slight legacy for a few days if you got particularly powdered up, but it just makes you more of a water warrior to let time do the cleaning and not the steamy long shower. Cover all seats with garbage bags before you leave home. Keep a box or bag in the boot for dusty powder covered shoes and clothing. Any powder on seats can be removed with a DRY vacuum. No water is required for this cleaning. If your car has any powder on it – do not use water to wash off. Use a blower or dry cloth. So there you go! We’re up for it, you’re up for it so let’s do it together!